More congratulations are in order for Kyle, who just landed his first real job at Fisher Engineering. Kyle will be the "waterbug" moving through all the various work stations helping out as needed. 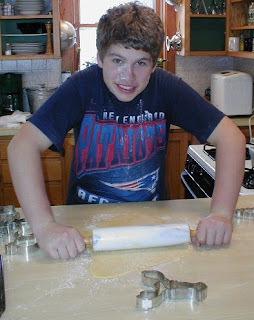 It seems like just yesterday Kyle was helping me manufacture holiday cookies, now he's a boy, er, young man in a snowplow factory -- what could be better? I had a nice chat with Kyle yesterday evening. He really has grown up. Congrats on the job! Right on Kyle!! you go dude!! I hope all the best to you in the new job. Congratulations to Kyle! I found your blog while searching for bloggers from Maine and I hope you don't mind that I placed a link to you in my sidebar.